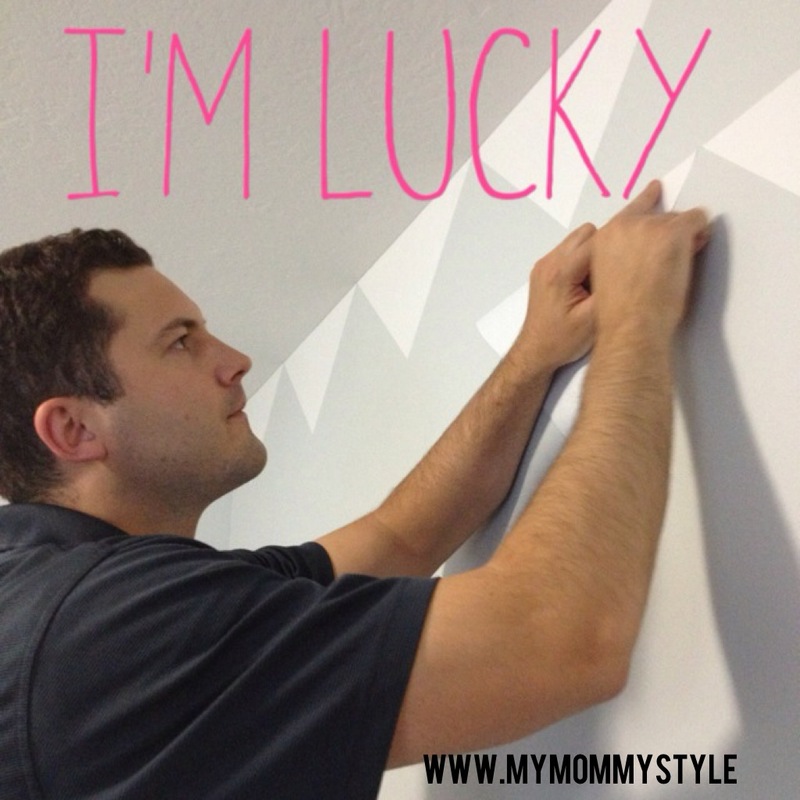 Vinyl Wall Decals are the easiest way to update a space without making any holes on your wall or the mess of painting and taping! Do you remember this inspiration board that I made last week? Well, bits and pieces of the room are finally coming together. We recently moved into our home just over a year ago and my husband was adamant that we did NOT paint any walls. I was able to go without until now and was just itching to do something new for our new babe on his way. A compromise I found that worked for the both of us was doing vinyl on the wall. It is easy to apply and remove and does not require painting! YES! Luckily I was able to convince my husband that this was a good idea because between the two of us he is definitely better at measuring, placing, and doing the math required to make this project a success. You can buy these decals pre-made and they come in a variety of colors, but this just simply wasn’t in our budget. For this 8×10 wall it would have cost me $130. Triangles are not too hard to cut on your own so I decided to hunt for vinyl in bulk that I could use to my liking. None of the craft stores had what I was looking for the amount was too small per package for a project of this size. Luckily a neighbor told me about a vinyl/sign/supply store that offers you the ability to buy in bulk. They have over 72 colors available and even sell it by the yard so you can get as much or as little as you need. I decided to buy 10 yards which was actually a roll you could buy at a discount and have plenty left over. The ten yards cost me only $18. Seriously. In all seriousness, I am a lucky girl. I took some time measuring the wall from top to bottom and side to side; but when it came down to the serious equation of it all Paul helped me a ton. The vinyl came 26″ wide, originally we started with 9″ x 9″ squares and cut them down to triangles but realized that these would be too small and require a lot more cutting than we wanted. We settled on 12″ x 12″ squares that came out to by triangles that measure 12″x 12″ x 17″. On our 8 x 10 wall this ended up being 9 triangles across and 10 rows total going from top to bottom for 90 total triangles. If you want to make your own measurement you can apply the Pythagorean theorem to make sure that the space your filling will be the right amount of squares for the spacing you would like. Once you have figured out what size works best for you it is time to cut and apply. Here are some top tips we took away from this project. *When starting your placement use a flat edge like a ceiling or a wall to guide your row to keep things straight. *Triple check the math and draw a map out. You don’t want to be left with a large hole once the project is finished. 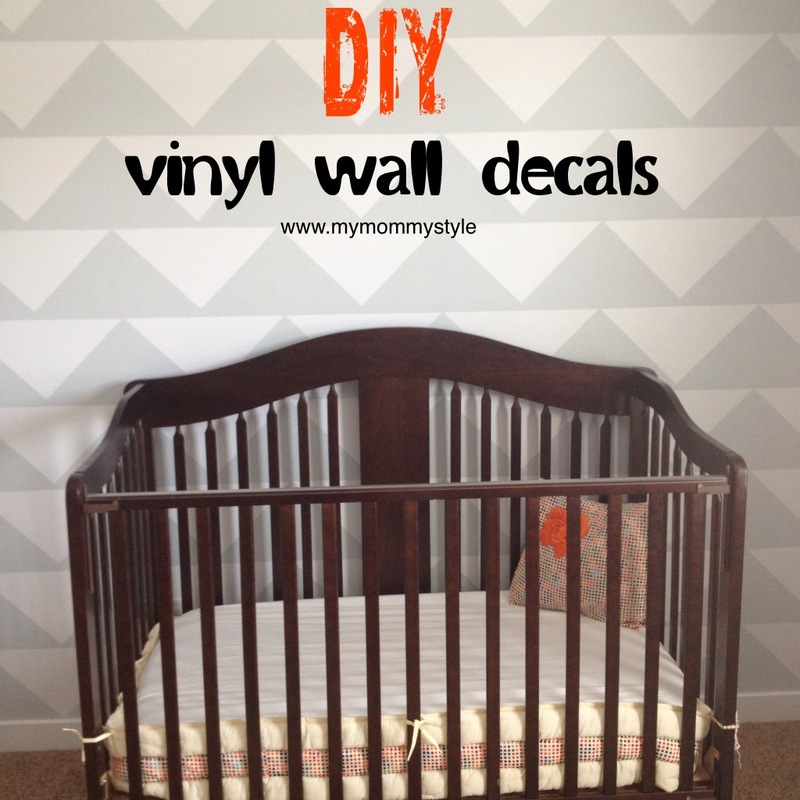 *Find something strong and flat to smooth out the bubbles of the vinyl as you place the shapes. I found an alphabet puzzle piece of wood that worked just fine. We also found it best to start at one corner of the triangle and then peeling the rest back as you go. One nice thing is that vinyl is very forgiving. If you mess up as you go along simply peel it off and make a reapply. If you have to cut another piece to replace it that is fine too. A BIG shout out to my husband who spent a lot of time making sure the cuts and measurements were just right. The math and measuring took just about as long as placing the triangles up (since it took me a while to decide what size I wanted.) Overall it ended up looking just how I wanted it and Paul even likes it declaring, “This is much better than painting!” Win. Win. **UPDATE. The name of the company that I was able to purchase my vinyl from is Regional Supply! They are super friendly and will even help you figure out the measurements of what you need. They have DOZENS of color options, if you need to match a different color exactly. You can buy the large rolls for even less if you are buying black or white. And don’t forget to tell them My Mommy Style sent you! This wall is going to be for the “Little Adventurer” nursery for our baby boy, but Jayne is loving them in her room right now (since I still have her in a crib.) So this is just a sneak preview of what it will be. I LOVE IT! If you decide to do this project please share your pictures with me, I’d love to see them!